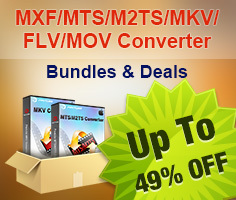 Pavtube FLV/F4V Converter - Convert FLV/F4V to AVI/MPG/MP3/WMV. Output to iPad and various mobile phones. The program is a two-in-one program: a powerful editor and a fast converter for FLV and F4V. You can enjoy a faster conversion speed with optimized converter in less time. This program supports to add different watermark types, including text, image (including GIF), and video watermark to the MOD. With its video watermark functions, you can add a picture-to-picture effect to your video. If you like, you can adjust the video brightness, contrast, saturation, or add special effects like simple laplacian sharpen, gray, flip color, invert, aged film to have a fun. Meanwhile, you can check deinterlacing to get better video quality. The program's editor section allows you to get any video length you want with Trim, just drag the process bar to the trim points; cut off the black edges and unwanted video area easily with Crop; merge many videos into a signal one; replace the original audio even adjust audio volume. - Fixed out of sync and crash issues. - Added AVI AC3 format for PS3 streaming.